Sanyo Corporation of America will support the exhibit of our parent company Sanyo Trading Co., Ltd., at Pittcon 2014. This event will take place March 3-6 at McCormick Place Chicago. 1) SHINTO Heidon Surface Property Tester Type 38. 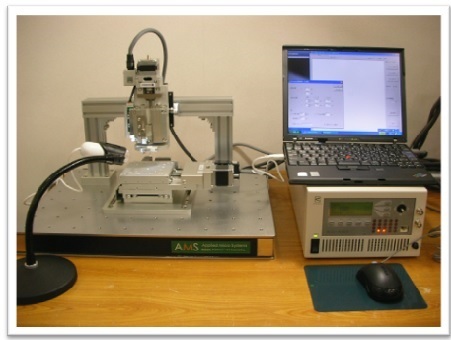 This instrument allows real-time measurements of changes in frictional resistance due to wear. 2) Needle Dispenser by Applied Micro Systems. With this ultra microdrop dispensing system you can apply picoliter droplets of highly viscous liquids precisely. 3) OD Monitor by Taitec. With this, you can measure the OD easily and efficiently, while cultivating as usual. While the above mentioned products are being exported from Japan, please be advised that Sanyo Trading with its Scientific Instruments Business Group also imports analytical instruments and testing equipment to Japan. Customers are R&D labs of government institutions, universities and manufacturers all over Japan, as well as quality control divisions of chemical, petrochemical, pharmaceutical, food, machinery, automotive and energy industries. Main products include tribology, weathering and surface physical properties testers, emission spectrometers, WS-CRDS, bio-process sensors, SPF analyzers, IR/Raman based systems as well as vacuum-related equipments. We are continuously looking for innovative products for distribution in Japan. Please visit us at booth #659!